The PRICE OF GOLD plunged $20.50 (1.7%) to close Comex at $1,152.40 while SILVER fell 76.1 cents or 4.84% (put your eyes back in your head) to $14.95. Let’s get one thing straight: my interpretation presupposes that we are witnessing seasonal lows for silver and GOLD PRICES that will follow the usual seasonal pattern and pull up the rest of the year. If I am wrong about that, then silver and gold prices could plunge as bad as some analysts have been calling for. Until I see that confirmed, I will stick with my seasonal low interpretation. The gold price made its low for the post-2011 correction last November at $1,130.40. Draw a line from there through the March low and it will form the bottom boundary of an even-sided triangle that gold broke up out of in May, only to collapse. Extend that boundary and you catch today’s gold low. Also, gold is right on that downtrend from October 2012. Gainsayers: RSI is not oversold as it was in November and May, nor are other indicators at the same extremes. That makes me gulp, but I’m sticking to my seasonal pattern story all the same. The SILVER PRICE pierced $15.50 support stretching back to last November. Remember that freaky one day silver plunge on 1 December 2015, when it went down to $14.165 instantaneously and just as instantaneously recovered on huge volume? Well, that’s the next support, if today doesn’t belong to a one or two day wonder spike low. As with the gold price, RSI and other indicators aren’t particularly encouraging, but that’s the way it always is at bottoms. Confirmation comes later. Here is the GOLD/SILVER RATIO chart on the right, to add one last consideration. It broke above 76 resistance today nearly to touch the 77.88 high in December. In its case its RSI is over bought (though not severely), and other indicators are more positive, that is, about to turn down. A ratio high is consistent with silver and gold seasonal price lows. I’ll be switched! I have one other little thing to think about: Bollinger Bands. Gold price today touched its THREE standard deviation lower BB. Silver cut clean through its 3-sigma BB and then some, just like 1 Dec 2014. That would indicate a turnaround lies not far in the future. I’m not minimizing the risk that silver and gold will fall further here, but I am also looking at a world economy trying to shake apart like an old Yugo, with the only rotten, scrofulous fiat currency standing the US dollar, and it’s leprous. Whatever respectability the dollar had left has been all squandered since 2008 by the Fed. In a panic that dollar might shoot up, but when the dust begins settling, silver and gold will surge — and last. I know y’all are all worked up about today’s markets and the metals’ plunge, but I’m gonna circle around it first. World’s big problem is not Greece but China, and that didn’t start yesterday. Friend from another country who builds turnkey plants told me 10 years ago the Chinese were building plants IMN — in the middle of nowhere. ‘Tain’t conceivable, either, how much loss and waste is in state sponsored industries, or corruption elsewhere. Now add the Chinese propensity to gamble, and I’m not talking mah-jongg but stocks. From 25 July 2014 through 12 June 2015 the Shanghai Stock Exchange index rose 2.43 times — added 143% or roughly 12% a month on average. Sprinkle in liberally a little history: the development of every undeveloped economy always ends in overdevelopment and crash. Then there is the myth peddled everywhere and believed by everyone that a nation run by socialists at the top — notwithstanding their ingrained Marxism –can become the world’s economic Wunderkind. I reckon all those believers thought corruption was going to save Chinese capitalism from communism. 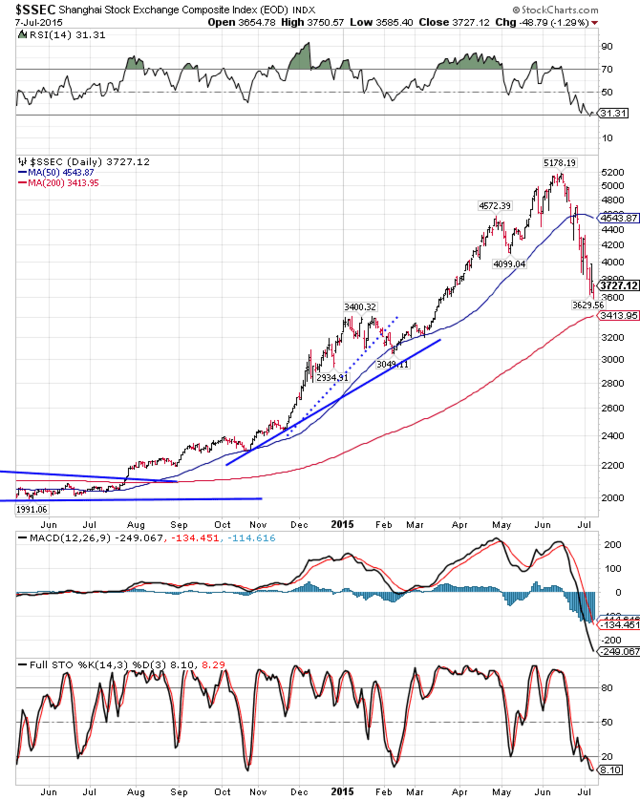 Since about 16 June the Shanghai Index has plummeted 28% at today’s low. Last week the Chinese government pulled out all stops to check the panic, even buying stock futures just like the Nice Government men here, servants of our socialist masters. Over the weekend government out did the capitalists: offered a stock stabilization fund, moratorium on IPOs, liquidity pledge from the People’s Bank of China, and guaranteed liquidity to the state-backed margin lender. Shanghai rose 8% Monday, and then fell again today 1.29% to a new intraday low for the move. This much of the China myth is true: they’ve been buying lots of commodities for years. That’s what routed commodity markets today, most likely, the prospect of the Chinese ceasing to buy and stockpile huge amounts of commodities. That probably helped rout silver and gold, too, as perhaps Chinese seeking to meet margin calls sold gold. Sad lesson coming for the Chinese about the difference between stocks and gold. Finally, China has 1.357 billion people and an $18.9 trillion GDP while Greece has 0.0108 billion people and a $0.294 trillion economy. Even a no-nothing hick like me can see there ain’t no comparison for trouble-causing potential. While Europe (not zackly in prime economic shape itself) keeps diddling with Greece and bailing out its banks, now China is threatening to blow apart. It’s enough to send our Masters of the Universe running for the Excedrin — or reaching for a waste basket to puke in. We’ve closed the circle now and come round to today’s markets. The Nice Government Men for the Socialist States of America managed to jack the Dow from a 17,466 low, down 218 points, to ending up 93.33 (0.53%) at 17,776.91. Call me a conspiracy theorist, see if I care. They’ve got a Plunge Protection Team and they use it. Besides go search the Wall St. Journal archives for that November or December 1987 post mortem series on the 1987 stock market crash. It’s all in there — from Greenspan to the lower apparatchiki, they all braggd how they bought the S&P500 futures and smashed gold by trashing platinum futures, arm-twisted CEOs to buy their own stocks, etc. So don’t turn your New York nose up at me as a “conspiracy theorist.” Everybody knows the Wall Street Journal wouldn’t print no lie. Whooo. Got worked up there. Sorry. S&P500 rose 12.58 (0.61%) to 2,081.34, respectable enough, and like the Dow, to bring it back from beneath the 200 DMA AND a new intraday low for the move. Y’all think I’m jes’ a barfut nat’ral born durned fool from Tennessee, but if y’all stick with them stocks, y’all are gonna take a Chinese lickin’. Am I digging around in my drawer for a box cutter to open a vein because they punched into the top gator jaw? Don’t hold yer breath. Punching into that overhead jaw is consistent with seasonal lows in silver and gold prices. And on plunges silver always plays the weak sister. 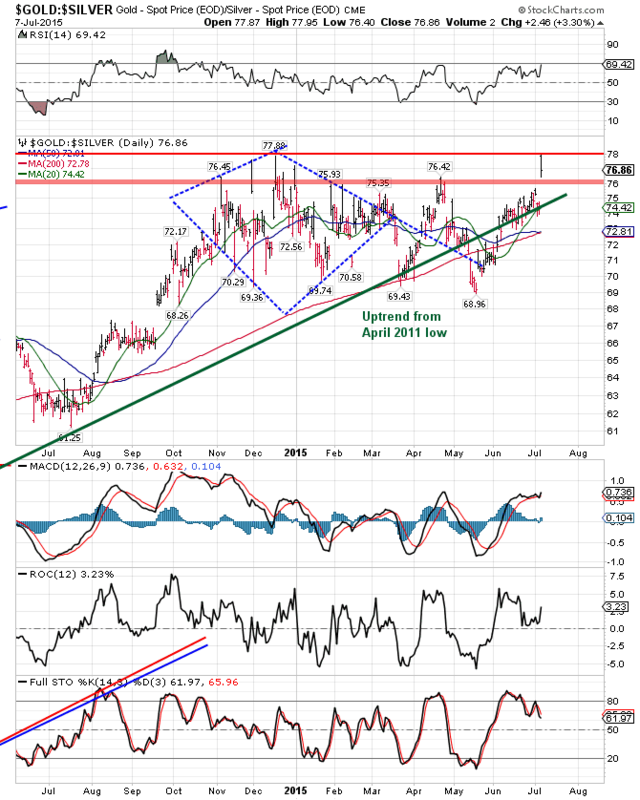 The US Dollar Index helped precipitate all this turmoil by breaking out today above the 96.50 resistance, as it has been threatening. Today it jumped 60 basis points to 0.62%. 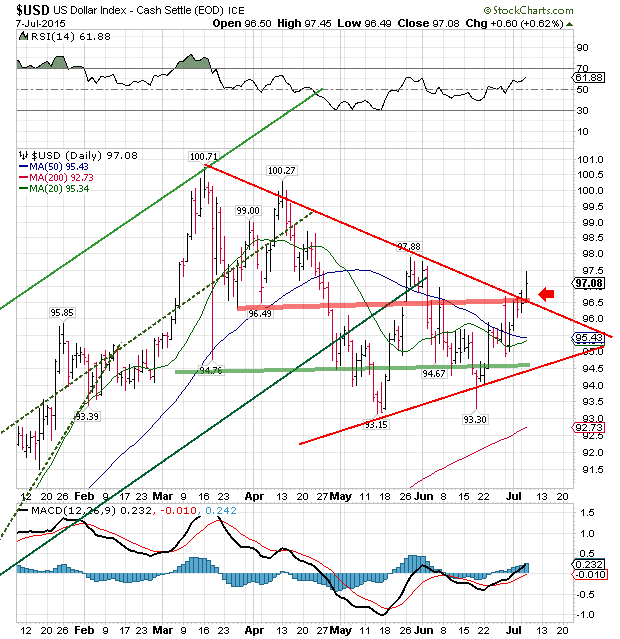 Measuring the triangle it broke out of, the dollar index could reach for 103. Chart’s on the right. Euro is the mirror image of the dollar index, so it dropped 0.49% today to $1.1004, targeting $1.0350 or oblivion, take your pick. Yen is even trying to rally, but the Japanese NGM are keeping it tame. Up 0.03% today to 81.61, but intraday tried to punch through its 50 DMA. As you’d expect with the dollar index rising and somebody fixing to panic, yields on US Treasuries gapped down again today (Treasury prices gapped up), for the second day. Clearly, some of the guests are paying big money to check out of the Hotel California. but not no gummit agincy, no sirree! Silver Eagles’ already overblown premium will rise . I don’t recommend them now, as I didn’t recommend them yesterday or for the whole course of their existence, because they are too blasted expensive and OVER TIME PREMIUM ALWAYS DISAPPEARS. On 7 July 1863 the US (north) began its first military draft. You could buy an exemption for $100 or 4.8375 gold ounces, today about $5,565. So many northerners opted out that the yankee government started running out of soldiers and stooped to kidnapping Irishmen off the boats and importing Germans who couldn’t read US newspapers.